A man from southern China has set a new world record by inflating 12 car tyres at the same time by blowing through his nostril, local media reported. 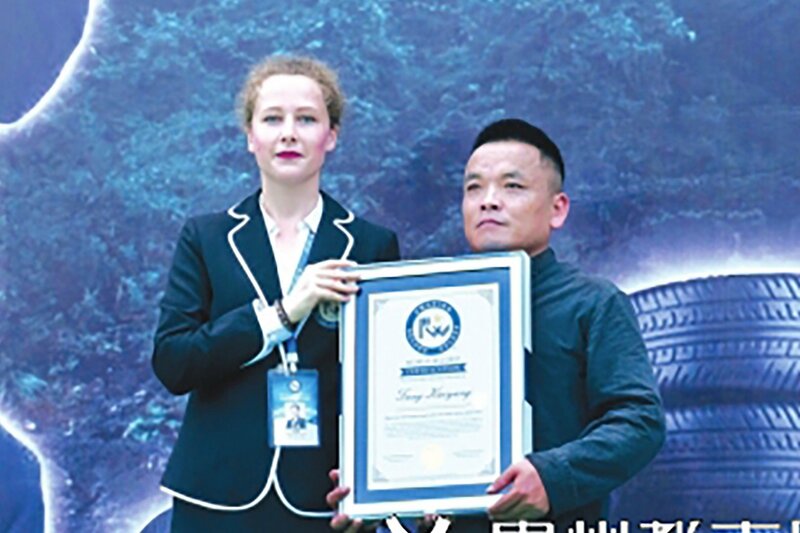 Tang Feihu, 43, from Kaiyang, Guizhou province, performed the feat in two and a half minutes at the Nanjing Grand Canyon competition at the weekend, Guizhou City News reported on Monday. He has been performing stunts at fairgrounds for years as a way to supplement his family’s income from farming. Tang decided to learn the tyre trick a couple of years ago after watching videos of it online and deciding that because he had spent years studying martial arts and the traditional practice of qigong, which develops body movement and breathing, he would give it a go. Since then he has performed the feat about 20 times at various shows around the country. Last month he applied to the London-based World Record Certification agency for recognition of his feat and was duly awarded a certificate after performing it at Sunday’s show, breaking the previous record of six tyres.